In late June and early July 2018 I take a two-week road trip to Calgary from my home in Victoria. As a Life Member of the Royal Astronomical Society of Canada (RASC), I like to participate in the society where I can. The RASC General Assembly is a great time to socialize with my fellow amateur astronomers from across Canada, update myself on what’s happening in astronomy, and ensure RASC continues to be a relevant learned society to Canadians. Along the way, I can experience the grandeur of the mountains and valleys in southern British Columbia, the Canadian Rockies, and the Alberta Foothills and prairie during a great time to travel. 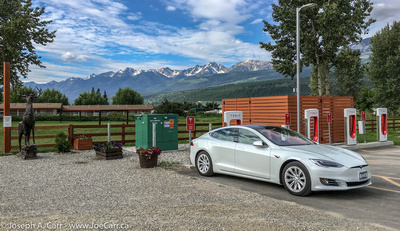 Originally, I had booked a WestJet flight to Calgary, which is certainly the least expensive and quickest way to get to Calgary, however I eventually decided that driving my Tesla Model S electric sedan would be more rewarding. I wanted to fully enjoy beautiful southern British Columbia and Alberta. Driving my fully-electric vehicle also saves carbon emissions and fuel costs, allowing me to experience the sublime pleasures of slow travel. I take the opportunity to visit with friends and family along the way. I also take along more gear, which adds to my enjoyment of the fascinating places along the way. I fly my Mavic Pro drone several times, which gives a whole new perspective on those iconic views along the highways. The route to Calgary takes me over wonderfully scenic highways across southern British Columbia and through three national parks: Glacier, Yoho, and Banff. I take three days to drive to Calgary, and five days on the return trip. I stay a week in Calgary, taking all the sightseeing activities hosted by RASC Calgary Centre, and stop for a couple of days in the beautiful Okanagan Valley. The RASC-hosted tours out of Calgary are excellent, and offer both main-stream sights as well as locations that would be difficult to appreciate without local knowledge. I enjoy my road trip very much. Late June and early July is a good time to go before the crowds descend on the popular spots, and the weather is near-perfect, with the exception of a couple of overcast and rainy days in Alberta and the Okanagan Valley. I cover a lot of ground, seeing several sights in southern Alberta that are new to me. The Canadian Rockies are always spectacular, as my photos (20 minute slide show) will attest. I visit with one of my elementary school friends in Okanagan Falls on the way back, and while I was in the area, I have a fascinating tour of the Dominion Radio Astrophysical Observatory. I even manage to fly my drone in some locations along the way, so overall the trip is a great success!